Remember how I recently discussed how hard I find the process of making decisions? 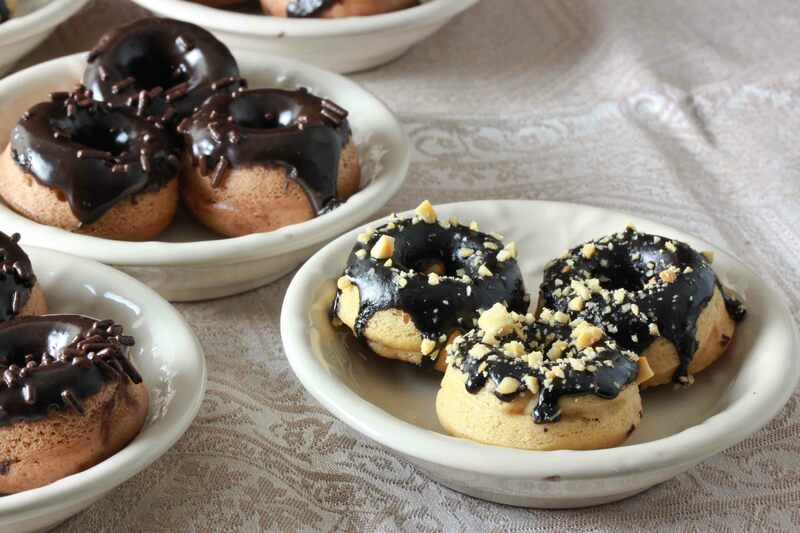 Well tonight’s post is basically a post script to that one, because if you thought deciding between pecan pie or brownies was hard, imagine trying to decide between chocolate glazed peanut butter donuts or glazed nutella (chocolate hazelnut) donuts! I know, it totally boggles the mind. Well I, for one, don’t believe in making such difficult decisions. So I thought to myself…why choose? Yep, that’s right. I made both peanut butter donuts and nutella donuts. 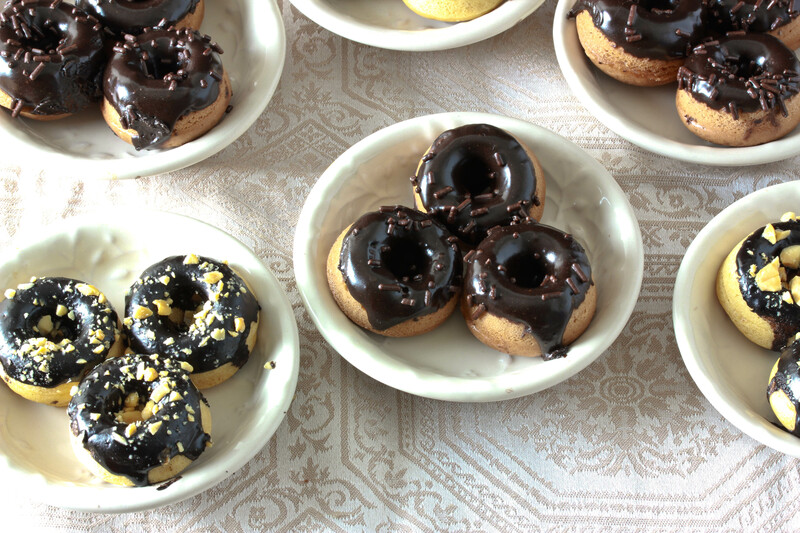 Which means, if you think about it, that these donuts are super easy to make. Because I started making them late at night, and still had time and patience to make a second batch. Psst! Looking for traditional fried donuts for Hannukah? Well, I’ve got you covered! So, will you make both? Or pick one of these? Either way, you can’t really go wrong. My tasters raved about how these are as good as fried donuts. Plus they are practically health food because they’re baked. And mini. This recipe makes very little, so I recommend doubling it. Preheat oven to 325. Lightly grease a mini donut pan and set aside. In the bowl of an electric mixer, beat together the peanut butter and sugar and set aside. Add in the milk, oil, vanilla and egg. Beat to combine. Add the flour, baking powder and salt and stir until evenly distributed. Pour the mixture into a resealable bag or a piping bag and cut a small hole in the corner. Pipe the mixture into the donut pan, filling the cavity about 3/4 of the way to the top. Place in the oven and bake at 325 for 5-6 minutes, until the top springs back when touched. Remove donuts from the pan, and set aside to cool. Repeat with remaining batter. To make the glaze, mix all ingredients together in a small bowl and stir to combine. Dip cooled donuts into the glaze, then sprinkle with finely chopped peanuts, if using. Allow the glaze to set before serving. In the bowl of an electric mixer, beat together the nutella and sugar and set aside. Place in the oven and bake at 325 for 5-7 minutes, until the top springs back when touched. Remove donuts from the pan, and set aside to cool. Repeat with remaining batter. To make the glaze, mix all ingredients together in a small bowl and stir to combine. Dip cooled donuts into the glaze, then sprinkle with sprinkles, if using. Allow the glaze to set before serving. Note: to use a full size donut pan, bake either recipe for 8-10 minutes. Look how I just freed you from making a tough decision! You can thank me later. PS: Did you enter the fabulous giveaway I have going on? How I’d love to have these sitting on my counter for breakfast tomorrow! What? Doesn’t everyone love to eat baked donuts for breaky? I’be been waiting for this recipe! Canyou tell me how many mini donuts you got from a single batch? Does anyone know an egg substitute? i think flax meal is an egg substitute…google it! This looks wonderful, thanks for sharing! I like the new pictures on the top of your blog. 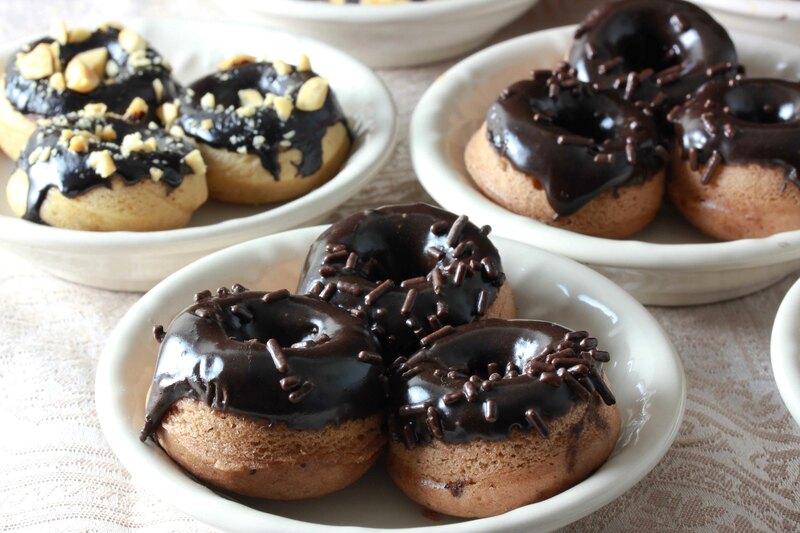 i’ve been wanting to try baked doughnuts for soooo long… and now that you said nutella, i think i have to! I wouldn’t know which to pick! well, good thing you’re not my neighbor! these look so incredibly delicious!!! Can i use a cupcake pan instead? super yummy! i love donuts!! If I don’t have a donut or mini-donut pan, what can I use instead?